Leaves are changing colors, it's getting darker earlier, and sweater weather is officially here, not to mention pumpkin spice everything, everywhere. As you look forward to the changing season, do you worry how the additional baked goods, candies, and unhealthy treats prevalent in the coming months will affect your microbiome? We do. Which is why we are offering an incredible discount on one of our most proven and effective products: Body Prime. 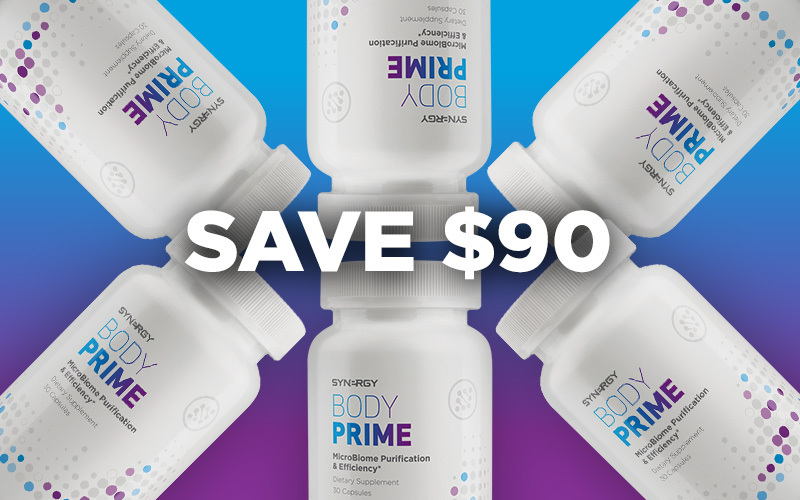 Now through October 31, get a 6-pack of Body Prime for $90 (60 CV). This bundle saves you $90! Body Prime is made with magnesium, prune powder, and apple pectin. These simple ingredients impact the microbiome powerfully to support cleansing and bowel motility. But don't worry, it's not going to have you running to the bathroom every few minutes. It is gentle, yet effective. Additionally, magnesium is a crucial mineral for maintaining a healthy balance of electrolytes, and is an important micronutrient in the reduction of fatigue. It has also been proven to have positive cardiovascular benefits. Before your gut begins to feel unbalanced or "off," stock up on what it needs to function properly all season long. Order Synergy's powerful microbiome cleanser today!